How to resize pictures/photos with just a right click in Windows XP/Vista/7 ? Sometimes when you simply want to resize the photos to be uploaded to facebook, or send to your friend, what will you do? Open up a software, wait for it start, load the photos, select photos and resize? No more. Here I will show you how to natively resize photos/pictures with just a right click on the photo, and it’s almost instantly (small quantity of photos of course) resizing your photo to what you desired. Select the size of the resized photo – In here, you can select the size you want, let say for facebook photos, you can just resize it to Small which will be just nice and quick to get uploaded. You can also customize the size you desired. 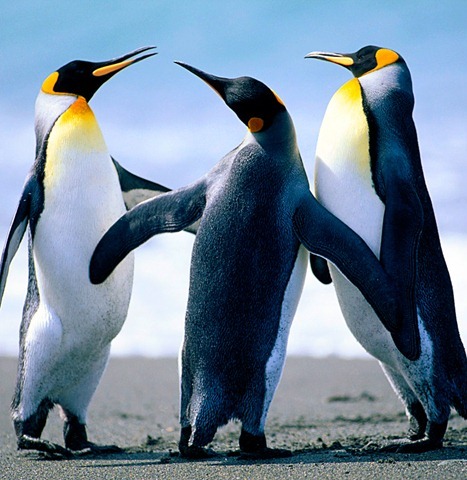 Makes pictures smaller but not larger – This option is needed when you are not sure whether you are making your photos smaller or larger. Without this option ticked, if your source pictures is say 640×480, then you select the Large size option, the photo will be resized to 1024×768, which will be low quality since the source picture is in lower resolution. 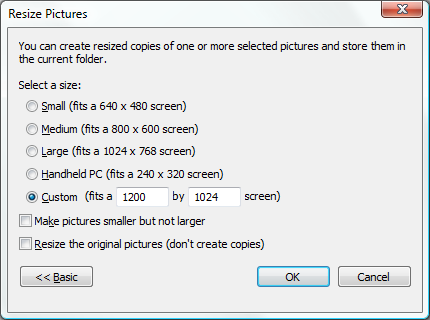 Resize the original pictures (Don’t create copies) – If this option is ticked, the wizard will resize the original photos, thus not making any backup for the photos. 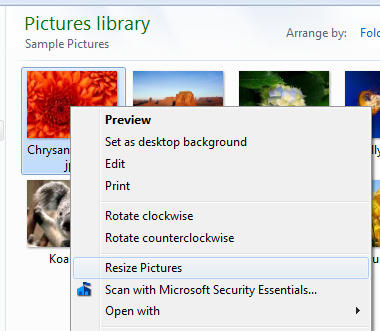 Ideally for the situation when you just require a few photos – Copy the photos needed to a new folder, select this option to resize, use the resized photos, and delete them. Simple. How about Windows Vista/7? It is just too bad that Microsoft didn’t make the same application for them, but fortunately BriceLambson had it cloned for Windows Vista and 7, what’s more it has been written to support 64 bit! You can get it from here if you are using Vista/7, either 32 bit or 64 bit. The interface will be totally the same, with just an easy right click and you can start your resizing task right away. Previous PostA Quick Review on Microsoft Security EssentialNext PostHow to zip/unzip archive online without installing any archive manager?